Richard Cullinan is the Chief Instructor of historical Italian fencing systems at the Stoccata School of Defence. He first studied Italian fencing in 1997 under Peter Linich, Maestro di Scherma. 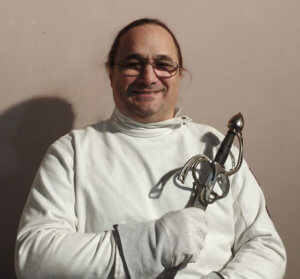 Building on this classical foundation, he branched out into historical fencing systems, and is now the leading researcher and exponent of historical Italian fencing systems within Australia, internationally recognised for his research in Bolognese swordsmanship, and has given seminars in Australia, New Zealand, and the USA. He has also qualified as an Instructor at Arms in Classical Italian fencing through the Fencing Masters Certificate program at Sonoma State University, California. Richard will present a historical fencing demonstration as part of the 2019 conference.